For that support pole in your garage you always seem to bang when opening the car door. Or when unloading groceries or the kids. That pesky pole is always in the way and is very unforgiving should you bang the car door not to mention your own head or one of your children's. The Lolly Wrap is not like any other type of cushioned column padding. Most importantly, it exceeds other basement or garage column pole pads, bumper pads and other commercial foam column cushion products. 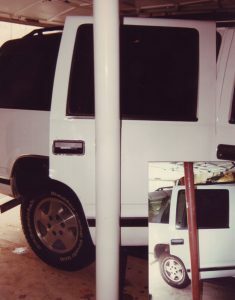 It’s a home safety pole padding system that’s inexpensive and easy to install. Lolly Wrap™ is a Patented product that was designed to give you safe cushioned column pad for use on your basement lally pole / column. Its’ inherent quality is to quickly and effortlessly convert a hard round or square support poles into a foam cushioned, SAFE and ATTRACTIVE design. As an added benefit, the protective cover is easy to clean and keep the kids safety a priority as well. The tough and durable high gloss WHITE OR TAN outer skin enclosure will clean easily with any solution. This durable lally pole cover will maintain its attractive appearance. Most importantly protecting the specially designed foam cushion enclosure from being cut or picked at by curious children when playing.